Romania: Chinese investor will make Craiova's dream come true? The municipality is still hoping to get the desired EU funding for their new 38,000-seater, but if not, a 'Plan B' option just appeared. Chinese investors are interested in building it. 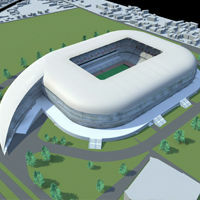 Craiova's ambitions envisage hosting the country's second largest stadium in the city. The dream of new 38,000-capacity venue is gaining shape as we await renderings of the final design. Mayor Olguţa Lia Vasilescu recently announced that this will be among the most interesting stadiums in Europe, as she already saw what is to be presented. Regardless of the visual side, financing still hasn't been secured. The city is hoping to catch some of the EU development funds for the 2014-2020 financial perspective, allowing to cover majority of planned expenses without overloading the municipal budget. But should the plan not work out, a new possibility has just appeared. Yesterday a Chinese delegation visited the Romanian city and expressed interest in building a residential estate, hospital and the stadium. This new chance would mean that Craiova doesn't have to have the money now, it would be covered over a 30-year payment plan to the Chinese.